If you’ve been under stress or upset recently, you’ll know how strong the feeling is to say or do something to get yourself out of that painful situation as quick as possible. However, often our impulse reactions make things worse rather than better. This weeks article explains by analogy how we can most effectively and quickly get ourself out of our mental and emotional pain by first becoming still. Quick reminder for those of you in Singapore, Saturday 7th December, 9.30am-12.30pm: Meditations for Transforming Negativity and Stress into Energy, Positivity and Enlightenment – A Three Hour Workshop, it’ll be more than worth your while! 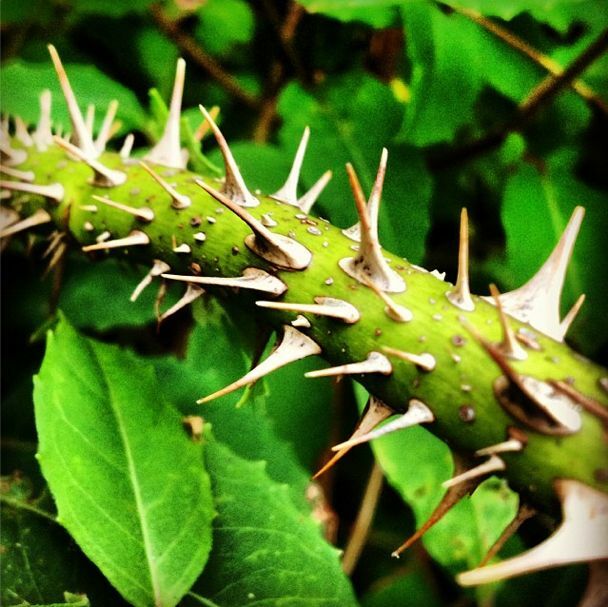 When You Are Trapped in a Thorn Bush…. …the best thing that you can do first of all is to stop struggling. This stops the thorns digging into your skin, thus preventing the short term pain, and enables you to see carefully what you need to do in order to free yourself one by one from the individual branches, eventually becoming free from the thorn bush and the pain altogether. When we are in a thorny mental and emotional space, the instinct can be for us to keep struggling and struggling, trying to find a way to free ourselves from the pain. Actually, the best thing you can do in such a situation is to first still your mind, create some inner space and perspective from which you can start to move yourself out of the situation, step by step. Feeling pain and conflict in your mind often results in you feeling compelled to act, often unwisely and non-reflectively. These unwise actions in turn create more friction and pain, which in turn compels you to act once more in an unwise manner. A vicious cycle is established between your busy, uncomfortable mind and inappropriate, unhelpful actions. A habit of stilling your mind and body when you are in pain and simply watching/observing for a while creates a space for your natural intelligence and wisdom to start functioning. This in turn enables you to see what needs to be done clearly so that you can act in ways that are actually going to solve your issues. This creates a virtuous cycle where the stillness of your mind enables you to act wisely, solve your challenges and thus create more peace of mind. So, the next time your mind feels painful, busy, uncomfortable think of yourself as being in a thorn bush; relax, pause and then when you are ready slowly and mindfully remove each of the branches from around you, one by one. Categorized under: Awareness and insight, creative imagery, Inner vision, Integral Awareness, Integral Meditation, Meditation techniques, One Minute Mindfulness, Presence and being present, Uncategorized. Tagged with: awareness, consciousness, inner growth, inner peace, integral meditation, integral meditation asia, integrated awareness, meditation, meditation and thorns, meditation in singapore, mindfulness, one minute mindfulness, power of mind, relaxation, spiritual intelligence, stress relief, the value of stillness, uniting mind and feelings.